Drawing a Blank | 2P START! Wow. This was maybe the most frustrating comic to make in 2P START!’s existence. 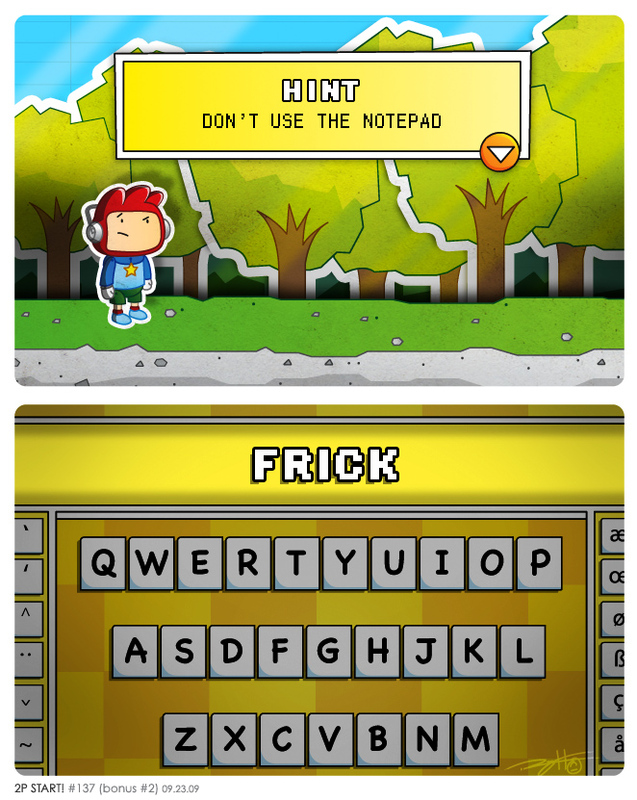 The problem with Scribblenauts is that when a game has no limitations, the joke could be ANYTHING. Of course that’s no guarantee that it’s funny OR that it’s unique. We had dozens of ideas, but they all felt too vague, specific, easy, unfunny, or philosophical to follow through on. In the end, this seemed the most fitting. Now I just need to find what’s missing for me…some sleep. Pretty interesting night, to say the least. Here are a couple ideas I couldn’t help but throw together afterwards just for kicks. Bonus 1 | Bonus 2 You’ll hear plenty more on the next podcast. I have to apologise for my briefness before, I wasn’t supposed to be browsing 2P Start! at the time, so I had to be quick before I was caught by my oppressors. Great stuff once again guys. Love the look of this comic, if only the real scribblnauts looked this good! Surprised you didn’t make a joke about maxwell jumping off to his death though thanks to the poor controls. Oh and please check out http://www.casuallyhardcore.net for some awesome video game clothing! So the lack of a punchline is the punchline? This comic is very exploitable. I wouldn’t be surprised to see a few fan-submissions. I don’t have any of your fancy Photoshop or Paint Shop Pro programs, though. I had to MS Paint it together, so pardon the pixels. Maybe I should listen to podacst after reading the comic. 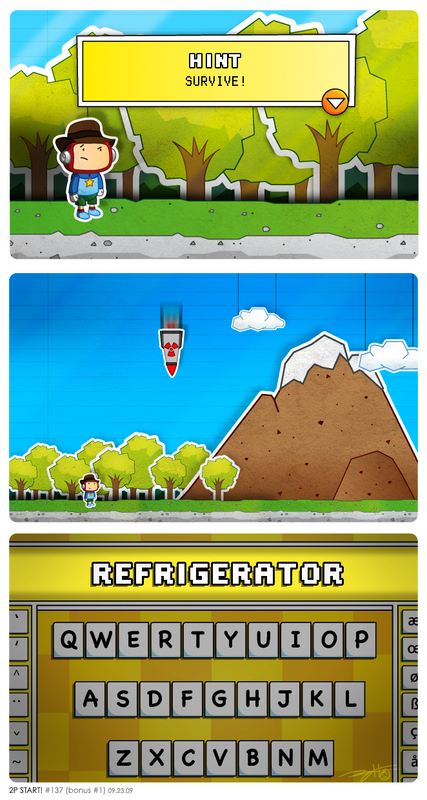 Somwhow I saw Scribblenauts comics coming. I actually liked the first bonus more than the real comic. I second that. The first one made me smile but I really laughed at the second one. It seems like several 2P START! comic are supposed to be funny because they aren’t funny. I liked bonus 1 more than the actual comic as well. Delightfully clever, and the bonus comics were great too. I think you’ve earned that gold star for solving the comic in three unique ways. My favorite was bonus #2, but I liked all three. the controls are so dumb i mean you cant use the control pad to move no configure in world 1 I had to fight the megadolon i killed him but i tried a jet pack but, it lost control so I fell in the water and it short circuited. anyways great comic as usual. I think the first bonus comic is better IMO. I think the Sun is missing. However, I LOVED the Indy joke in Bonus Comic 1. Gota love old Junior. Good comic guys. I too kinda thought the first bonus comic was funnier but the one without a punch line made me laugh too. It just seems like you guys have been using a lot of anti-humor recently. Bonus 1 was solid, but taking a jab at Indy and the KOTCS is way too easy. So kudos to your final choice. Also, nothing can survive a nuke. And a tidal wave is just the same. Loved the comic guys. Bonus #3 was my favorite. Nice comic, haven’t played scribblenauts, but heard about it enought to understand this week’s comic. Hah, pretty clever. And considering we pretty much got 3 comics this week is pretty awesome. But how does a refrigerator save him from a nuke-type-thing? I can’t tell if your serious or not, so just in case: nuking the fridge. Oh, haha, riiighhhtt. I guess being sick effects how I take punchlines. Very cool to have bonus comics to look at. I thought the Indy one was really funny, but only after I’d read the main comic. I like this comic because is is both a good joke and a sort of commentary on the scribblenaughts problem. Scribblenaughts if full to the brim with an ambitious concept, amazing potential, and all the parts and more that are needed for a great game, but somehow the developers missed making a real game underneath it all. The greatest lure of scribblenaughts is also its greatest downfall: Scribblenaughts lacks boundaries; it therefore is lacking as a real game. Scribblenaughts is a reminder that great potential and ambitious concept does not necessarily translate into a great product. Yup. Way to hit the nail on the head there. I saw the last panel and went, “Wooowww.” That’s kind of like, it’s so stupid it’s funny. I really like stating the obvious. It is a hobby of mine. Also, now that I think about it the bonus comics are made funnier in the context of the first comic. Makes it difficult to say which is best. Great comic! The artwork was fantastic and I enjoyed all 3 versions. 1) I sent an email about my grave-rising (should have been a comment). 2) I mentioned that laughing at podcasts can make bus rides uncomfortable (I later heard another fan say the same thing on a podcast). 3) I provided a link to a humorous site that I thought Tim and Ray would enjoy (It’s probably old news to them). Oh, well. It feels good to be out of the shadows! I have to agree with the several other comments that say Bonus 1 was the best out of the three comic versions. The other two just seemed lacking somehow (no pun intended), but I can’t complain for getting three comics! As someone else also already mentioned (man, I’m just stealing all kinds of comment ideas today :P), I wouldn’t be surprised to see some fan versions of the comic, especially since the original is so open and exploitable 🙂 *tries thinking of one* Bah, now this is going to be on my mind all day instead of focusing on my exam this afternoon. Ray the art looks incredible. More so especially because its so different looking from the usual style for the comics, but you pulled it off beautifully. On the writing side, as a webcomicker myself, I can really appreciate the joke in its incredible simplicity and elegance. In short: nice comic guys! Yes, this comic was sheer elegance in its simplicity. Anybody who gets that reference is officially AWESOME. Hmm, I’m thinking it’s from an episode of Middleman? Funny show, but I haven’t watched much of it. If that’s not it, maybe it’s from Dr. Horrible. tbh, i really loved all three comics. the bonus two were outstanding though. i was dying at the fridge and frick jokes. Wasn’t a huge fan of the main comic, but I found both the bonus comics pretty clever. I kinda expected “happiness”, or “self esteem” to be what was missing when I saw his face. Bonus comic 1 was defiantly better than the original one. Are we sure we can’t Solve the puzzle by tying an object to an Otter and luring it to me with a fish? Either that or tie a rope to a Pterodactyl. Either one works. Maybe we should type in Ncg, and see what we get. Really great looking artwork, though, I too thought Bonus 1 was the best. Umm…Bonus 1 rocks! But I don’t get how a lack of a punchline makes a punchline. I say Bonus 1 should have been the comic and the comic should have been bonus 1 🙂 Anway, NCsG! I’m getting the game on Friday, I can’t wait. All comments before this post were referring to the comic’s original version, in which only the ‘punchline’ joke was visible. All comments from here on reflect that of the updated version. Call an ambulance! We are losing him fast! I think we lost the only thing that made the podcast great. hmm, i saw it before, and i thought it was ok. I did like the bonus comics. Now that its updated. I just think it makes the webcomic one really confusing. What? Updating the comic within 24 hours of posting it?! PLOT TWIST! Hey, if Ray is going to update again, try toying around with the flow of the comic. It’s kind of a rough transition each punchline or lack of punchline. It’s also nice that you gave the background a bit more texture. I definitely like having all three comics together better than separately. The flow’s a little off now, but it gives the comic a bit more substance. Love your comic. 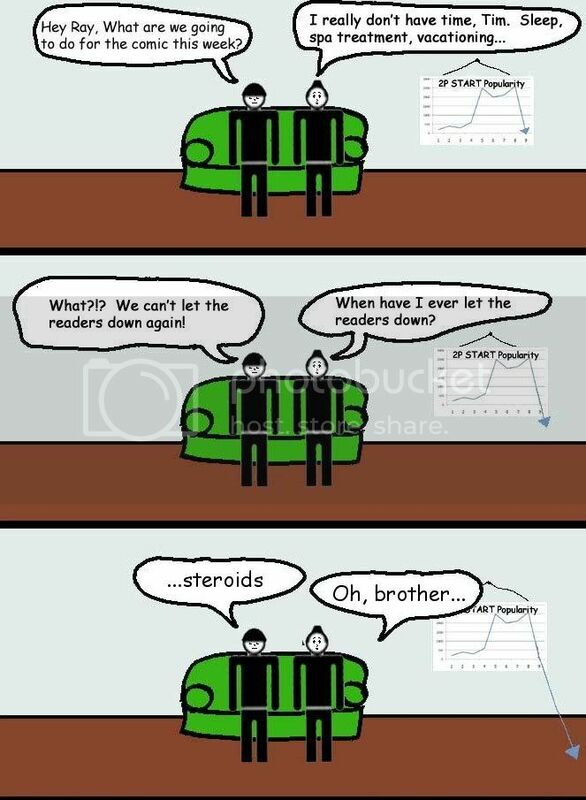 Especially since steroids is still my least favorite comic. Comic was pretty good this week. Not one of my favorites, but still had some chuckles. My favorite is the second one with the fridge. Hey Ray! Since your such a huge Sonic nerd fan, I thought you would be really interested in this if you don’t already know about it. I would have let you know sooner, but I only just found out about the site myself, so I’m sorry if you would have liked to buy the statue. However, it is just the first in the line, with tails coming next so I hear. I also heard rumors of Super Sonic at some point as well, so that should be cool. Probably no Black Doom or Chip. I honestly wouldn’t be surprised if a Rouge figure came along at one point. I suppose it is possible, but I wouldn’t count on it anytime soon. Right now they’re only doing characters from the original 16-bit games, so your not gonna see a Rogue statue unless they start a new line with those characters. Really good idea to put them all together, i think its better that way. ooOOoOhhH! Me Likey! Me Likey Alot! From what was once three, now form one. This is the best comment in the history of comments. AND I’LL FORM THE HEAD! Nice idea to add them all together. Me like. I might be the only one who thinks this, but I liked the comics separate. I think it works better as three different comics because each is self contained but they enhance each other. Bonus 1 was the best, but it is not as good without the original comic first for context. I think you had it right before. The frick one should have been last, and the refrigerator first. Rising from my grave. I’ve been away from the internet for a while and one of the things I missed the most was the fantastic podcasts and my weekly dose of 2P humour (this weeks Scribblenauts on was brilliant). Regardless of the negative comments that seem to have cropped up lately, yours is still one of the most consistently entertaining comics around. I’d love for you guys to get more merch up so that we, as fans, could give something back to you for the hours you’ve put in keeping us laughing. The art style is stunning and the joke suddle. I really enjoyed the bonus comics. and i like how you put all three together.